Gerry Zaltman is a distinguished professor at the Harvard Business School. I first discovered him in my own MBA studies where he was a guest lecturer and it’s obvious why large clients like Coca-Cola and Proctor & Gamble hire his consulting firm to better understand how consumers think. When I watched Gerry’s team go through an interview process that analyzes a consumer’s deep metaphors and links to brands through their innermost thoughts and feelings, I was mesmerized by the level of complexity and the clarity provided to the brand advertisers. For more information on his concept of deep metaphors, I also highly recommend his other book, Marketing Metaphoria, published in 2008 by Harvard Business Review Press. How Customers Think is essential reading for any small business marketer and especially the orthodontic practice that too often attempts to use a homogenous approach to selling a very heterogenous product, I highly recommend you review with your team leaders and take notes on chapters 4 through 7 and chapters 12-13. This is not to say the rest of the book can be skipped, but you’ll want to take extra care to understand the principles in these chapters. One of the “secrets” we’ve been using for years is what Zaltman calls being brutally honest ahead of time or what I call a “damaging admission.” If we anticipate bumps or hiccups down the road, it’s best to tell the consumer right out of the gate so that they are more prepared and likely to trust you in the future, because you didn’t promise something you couldn’t deliver. For example, as orthodontists, I recommend we always prepare parents and patients for the possibility that an impacted canine tooth cannot be erupted. Instead of presenting the best-case scenario, I’m transparent about the worst-case scenario. We do the same with parents who always want late appointments or who are unwilling to admit that their child was eating something they shouldn’t have been eating and now present with broken braces. 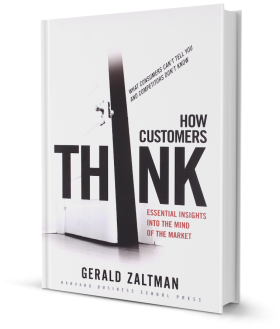 Professor Zaltman is a powerhouse of information and experience with real-world suggestions that can help any marketer who wants a deeper connection with consumers and a clear understanding of what makes consumers say yes to one product or service and no to another. As a business owner who takes marketing seriously, put this book on your shelf and refer to it over and over again.